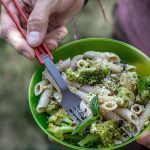 The first time I made this lemon broccoli pasta while camping, a full comedy of errors ensued, despite having made this dish dozens of times prior on my home stovetop. It all started with the gluten-free rice pasta I had decided to try for the first time. Thinking it was like any typical pasta, I cooked it as such. Only never having cooked gluten-free pasta before, I didn’t realize how starchy it would be. It all coagulated together into clumpy masses, appearing rather unappetizing. However, it was all we had to eat, so we had little choice. 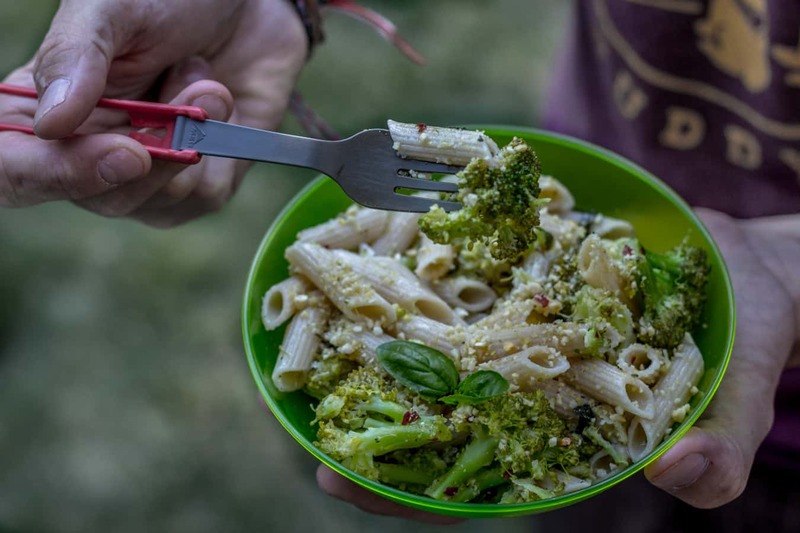 When I went to drain the pasta and broccoli, the pot slid off the camp stove and spilled gelatinous goopy water all over the picnic table, seeping down the cracks. It took me a moment before I realized that our dog, Sora was lying down directly below where I had spilled half a liter of boiling hot water. We got her out from under the table seconds after the spill. She was yelping in pain and her skin was red from the burn. We grabbed a bottle of cold water and poured it over her, while a fellow cycle tourist decided that was the perfect moment to come by for a chat. Since that terrible incident, I made sure that 1) Sora never sits underneath the picnic table while I cook at camp again, and 2) I vowed never to cook with rice pasta again (though have tried other gluten free pastas with success). 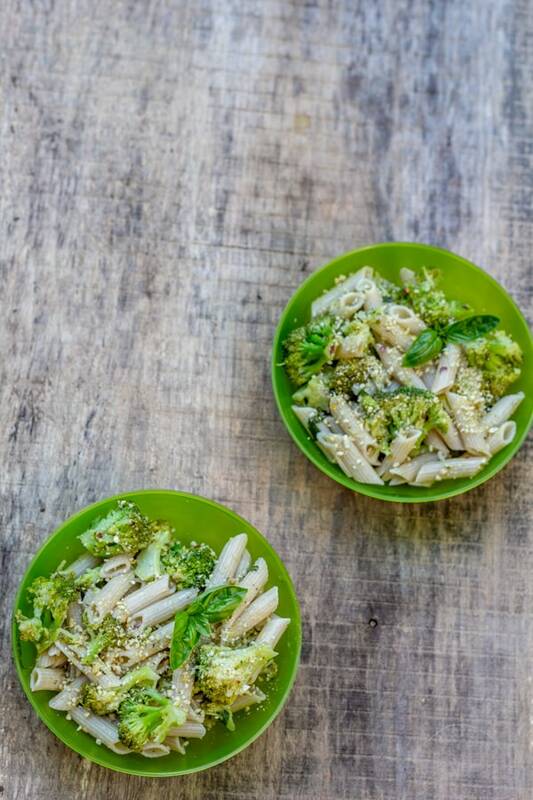 This lemon broccoli pasta recipe pops with bursts of citrus notes from the lemon juice and zest, tamed by the garlic, red chili pepper, and olive oil. 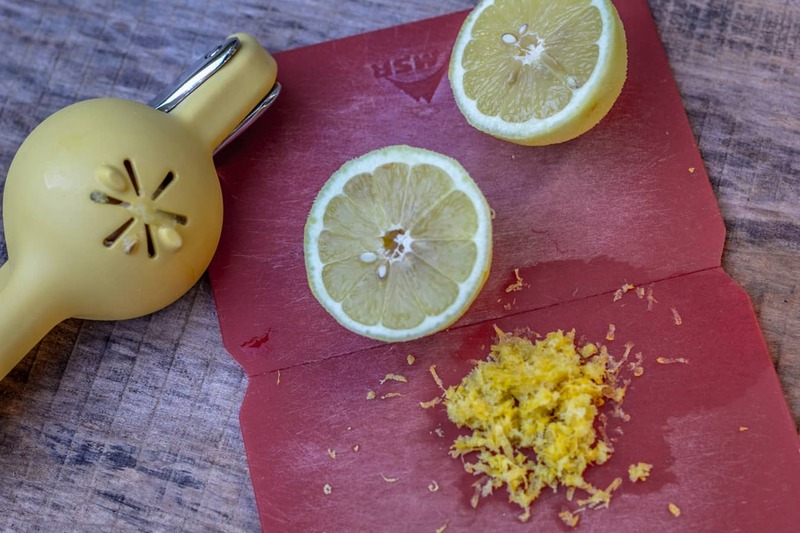 The basil adds a punch of herby flavor to the mix, making this recipe a hit at the campsite. 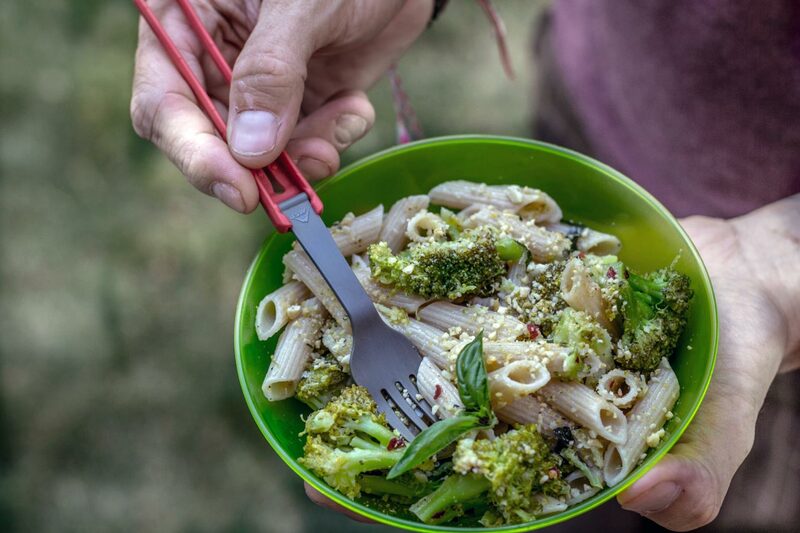 I love making this lemon broccoli pasta dish while camping. The one-pot factor means less to clean up afterward and it comes together in the amount of time that it takes to make regular pasta. This is one of my go-to meals when we’ve spent a long day out hiking or cycling or when I am feeling lazy at home. It comes together in just 20 minutes, which includes the water boil time, and we just can’t get enough! While you’re waiting for the water to come to a boil, measure out your olive oil, mince the garlic and chiffonade the basil. Once the water reaches a boil, salt the water and add the pasta. Subtract 4 minutes from the pasta cooking time (see your pasta's packaging for the time). When this timer goes off, that is when you will add the broccoli to the pot. When the broccoli and pasta finish, turn the heat to low and drain the water. It’s OK if there is a little bit of pasta water remaining, but try to keep no more than ¼ cup. Return the pot to the heat and add the olive oil, garlic, and red chili flakes and stir for about one minute, until the garlic is fragrant. Add the lemon zest, juice, and basil and stir to combine. Add salt and pepper to taste and top with desired amount of vegan parmesan. 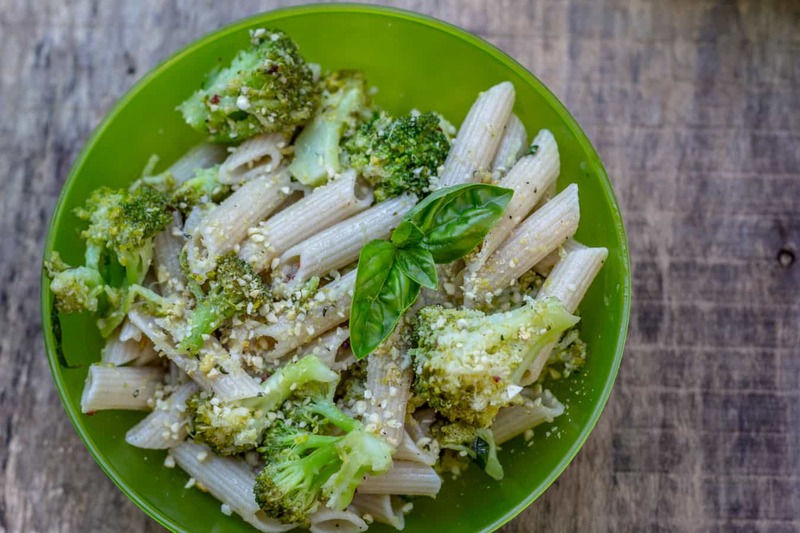 There are a few vegan parmesan cheeses on the market, or you can make your own (try this recipe from Minimalist Baker). In a pinch, you can just use nutritional yeast. This looks great! I’ve recently had lots of success with green pea pasta. Cooks nice and al dente. Bonus: It’s super high in protein and iron. Well, I’m glad you stumbled upon this recipe! I hope you give it a try soon. Thanks for your sweet thoughts about Sora. Luckily for her, I have made sure that this never happens to her again! She’s no longer allowed under the table while I’m cooking!